Few days ago we introduced NSI, is a very good and certified Investment program. NSI is not a bank, NSI does not collect your money rather NSI invests your money. 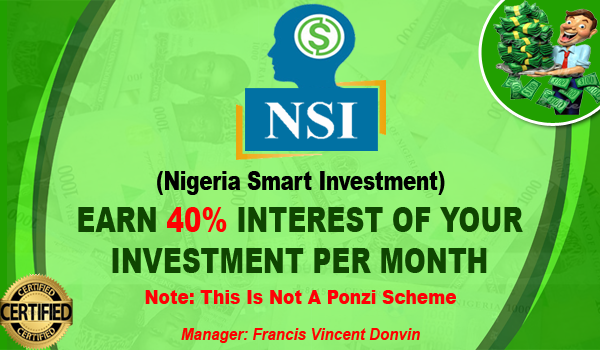 NSI is an Individual investment Program organized by one Person and it is not a Ponzi scheme so you don't have to be afraid of anything. The programme has helped so many Nigerians but for a while now there has been a little misunderstanding between the investors due to Little delay on payment by the Organizer Francis Donvin Vincent. Although The Organizer has earlier direct the issues and the cause of the Little delay on payment You can read HERE. I just still seek for a little time from my investors to restore My Investment Programme, I am struggling to set things right here, Everyone do have problem in business, Reason for my silence is simply Ego, and shame, I was ashamed I failed, I was ashamed I gave my haters chance to smile, I am not hurt because I will soon RESET them to default mode. Stay Cool has he Update you on this later. 1 Response to "I Was Ashamed I Gave My Haters Chance To Smile - Francis Donvin Vincent Speaks Again On NSI"
Why not get in touch with them privately than using a public scenario. Hope he get this all sorted soon, as the wait is not encouraging.